This is our goal. Information is not yet available. but in humility consider others better than yourselves. Giving is a sacrificial act of love. It recognizes that others needs are as important as our own and that we have a responsibility to our fellow man to uphold them in times of physical and spiritual need. Our gifts reflect a deep heartfelt pull to help others and this desire cannot be evaluated in terms of self-interest, as giving is a complete departure from our normal ego-centric decision making processes. Accordingly, the promptings of the Holy Spirit must be given priority in gifting decisions. Still, there is little question that improved donor stewardship of their giving to the work of the Lord would yield dramatically favorable results for the kingdom. The tools and services now available to aid Christian donors enhance the stewardship of their giving are robust and expanding. As donors increasingly combine their sacrificial giving and these tools now available in what we term the “Christian Ministry Marketplace”, those who are poor, hopeless and/or in need of a personal relationship with Jesus will be blessed even more than if this marketplace did not exist. Moreover, as the Christian Ministry Marketplace itself matures and develops, the effectiveness of giving will progress at an accelerating rate. A natural tension exists in the Christian Ministry Marketplace where two vendors of information dominate the landscape, the Evangelical Council for Financial Accountability (ECFA) and Wall Watchers, through its www.MinistryWatch.com service. This tension reflects the fact that a principal goal of the ECFA is to preserve the good reputation of the ministries that make up its membership, while Wall Watchers represents the interests of donors to Christian ministries. Both organizations share the common objective of increasing the amount of money available for the Lord’s work by raising donor confidence in the ministry’s carrying out these efforts. Both groups also seek to provide the donor with information that will assist in identifying ministries that are carrying the Lord’s work in an effective manner. The ECFA accomplishes this through its seal that signifies member acceptance of its standards and Wall Watchers through its comprehensive ministry research reports. This MinistryWatch Reflections article seeks to both highlight the need for improvements in the operation and funding of the Christian Ministry Marketplace and inform donors of the attributes of both the ECFA and Wall Watchers so that donors might better utilize the information these groups provide. Accountability, financial transparency, financial efficiency, theological stances and ministry effectiveness are all areas that either or both the ECFA and Wall Watchers seek to examine and report on. Improved donor understanding of all these issues is critical to building a healthy Christian Ministry Marketplace and thereby providing the proper marketplace infrastructure to most effectively finance the Lord’s work. As such, both the ECFA and Wall Watchers are of strategic importance to the cause of Christ and deserving of the support of Christians desiring to see the message of the Gospel spread broadly and quickly. Currently, donors and ministries combined dedicate a shockingly small amount of money to the issues of accountability and ministry research in relation to the level of total donations (just 0.014%). Moreover, donors are largely disenfranchised in the Christian Ministry Marketplace, which is dominated by ministries and related organizations. Donors are mostly left to fend for their interests individually as no group formed and financed by Christian donors, other than Wall Watchers, currently exists. If no actions are taken to improve the donor’s status in the Christian Ministry Marketplace, many good works may never be accomplished due to insufficient funding. Additionally, progress and innovation will be stymied and growth may continue to trail that of the overall economy. On the other hand, improving donor representation in the Christian Ministry Marketplace and empowering donors with rights much like corporate shareholders enjoy, could restore a right relationship between ministries and donors thereby igniting a renewed interest in giving. It would also cause current giving to be targeted more effectively and strategically. Wall Watchers encourages comments on the ideas expressed in this MinistryWatch Reflections article. A comprehensive dialogue surrounding these important issues can only advance the Lord’s work and we hope that this paper will help stimulate this much-needed discussion. While some of the points made in this article may at first trouble some current participants in the Christian Ministry Marketplace, we trust that reasonable consideration of our thoughts will ultimately cause them to be seen as a blessing to the cause of Christ and those ministries earnestly seeking to do His will, as they are indeed intended to be. We believe that the ECFA, Wall Watchers and other organizations in the Christian Ministry Marketplace are all tools in the Lord’s plan to impart even greater blessings to the lost, weak and suffering through Christian ministries. 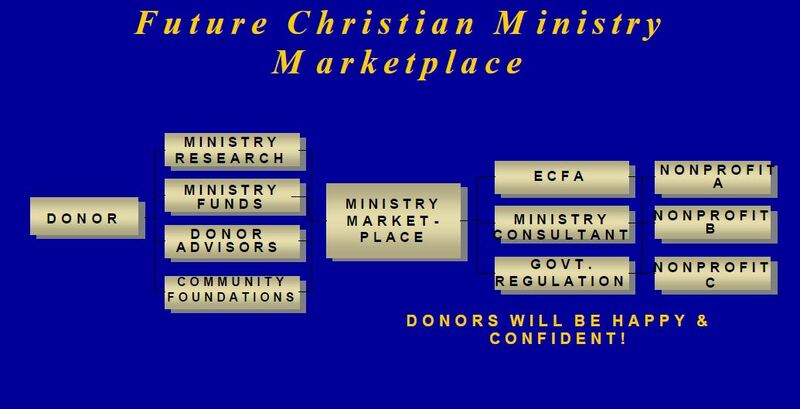 Before entering the discussion of the ECFA and Wall Watchers, we must first examine the Christian Ministry Marketplace in which they operate. Wherever goods or services are exchanged, there is a marketplace in operation. Those who are involved in an exchange make transactions based on some level of knowledge about the benefits of participating in the “trade.” The greater the knowledge each participant in a transaction has regarding the potential benefit of making an exchange, the more likely a “trade” will take place. Additionally, the perceived value of having engaged in the trade will be higher for both parties involved. A free flow of information that is easily accessible, accurate, low cost, comprehensive and of high quality is a key ingredient to any well functioning marketplace. 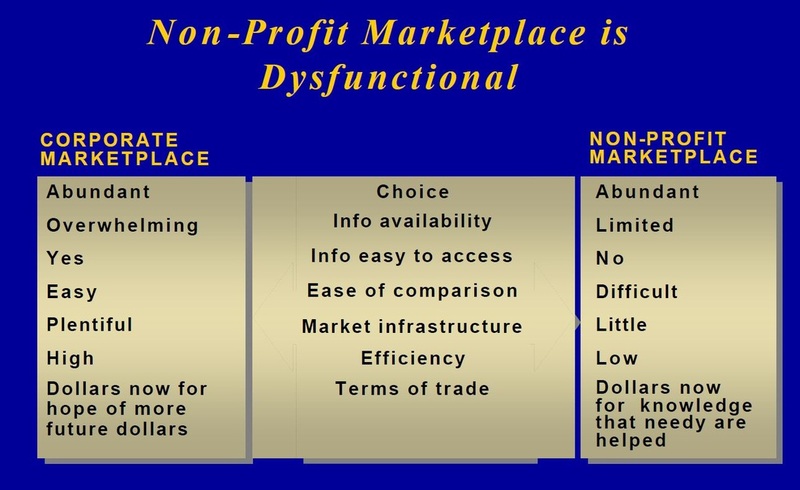 Some may argue that there is not a marketplace in the nonprofit world due to the absence of a profit motive. Despite this absence, there remains an exchange of donor dollars for the satisfaction of knowing that those in need have been blessed. With this gift comes a stewardship responsibility to both the giver and receiver to see that it has been administered appropriately and not wasted. Givers will not donate if they believe their gift will be wasted or misappropriated. Even though there is not a “bottom line” net profit measurement of success or failure in the nonprofit world, there are a variety of methods of gaining understanding about how efficiently and effectively donations are utilized. Donors will naturally utilize such measures to gain assurance that their giving was administered wisely. Accordingly, the marketplace transaction for nonprofits is simply the exchange of donor dollars for knowledge that the donation will likely achieve its desired goal of helping those in need. Some may be troubled by the notion that a marketplace indicates a competitive environment exists for Christian ministries. Several observers have expressed concern in the past that competition is inappropriate in a Christian ministry context. Wall Watchers believes that regardless of one’s beliefs about such competitive forces, competition undeniably exists in the realm of Christian ministries. Ministries are clearly vying for donor dollars and regularly use standard business practices to attract as much money as possible to their ministries. Ministries with competitive advantages in terms of scale or distribution regularly exploit these for their own benefit while smaller, arguably more worthy ministries, are unable to match the efforts of the larger ministries. Wall Watchers seeks to help donors obtain accurate, unbiased information about all Christian ministries to help level the competitive playing field in the Christian Ministry Marketplace. If competition exists, it should at least be fair. It is also quite natural to at first be repulsed by the idea of a marketplace in the realm of giving. Giving is a very personal, and hopefully prayerful, activity. Talk of marketplaces and competition seem to be out of place in this area where the spiritual dimension should take precedence. Nothing in this article is meant to diminish the spiritual aspect of giving. Wall Watchers acknowledges that any marketplace or information service that seeks to aid the Christian donor is ultimately subservient to the Holy Spirit’s leading. It is entirely possible that despite a large quantity of evidence that a donation should not be made to a particular ministry, a donor might feel lead by the Lord to give anyway. At the same time, however, we are confident that the Lord can and does use the tools that are available to donors in the Christian Ministry Marketplace to help align their gifts with His eternal purposes. By remaining faithful to the teaching of the Bible and sensitive to the Holy Spirit’s promptings, donors can know if, how and when to best utilize the growing information available to donors about the ministries that they support. Government Regulation - Government regulations are comprehensive and set up a framework in which both buyer and seller can be treated fairly. Self-Regulation - Self-regulators, such as the exchanges themselves, place further constraints on the behavior of their members to ensure trustworthy service to those who access the stock exchanges to trade shares. Independent Advisors - Corporations selling shares can rely on wide variety of accomplished investment bankers and other consultants to advise them on how to best promote their shares to investors so that they can raise capital to grow their business. Investment Research - Investors in a corporation’s shares can, in turn, rely on a multitude of information sources (stock brokers, mutual funds, Morningstar, Value Line, rating agencies, financial planners, the Internet) – often offering conflicting advice – to help them determine whether purchasing the shares would likely be profitable. While an investor’s decision to purchase a stock may or may not ultimately prove profitable, each party to the transaction enters the exchange feeling highly confident that they are making the right decision. This confidence reflects the quality and depth of the marketplace infrastructure that makes accessing worthwhile advice and information quick, easy and affordable. Accordingly, participants in the stock, bond and currency markets are willing to make transactions each day, which combined, measure in the trillions of dollars. As a result, financial marketplaces like stock exchanges are amazingly effective at efficiently directing investments to where the highest return is expected to be found, thereby spurring progress, growth and innovation. This represents a good example of what might be achieved with a more developed and robust Christian Ministry Marketplace. Government Regulation - First, the framework for the market’s operation as established by government regulations, notably from the IRS, is weak. Regulations are often not effectively enforced and audits are infrequent. The IRS has little incentive to spend its limited resources in the nonprofit arena, as any fines assessed for infractions by most nonprofit organizations would be paltry in comparison to what similar IRS efforts might yield in the for-profit world. Moreover, even when the IRS uncovers a problem, donors are unlikely to ever find out about it, as such matters are generally resolved behind closed doors. Self-Regulation - Second, while the ECFA provides the best self–regulation to be found in the nonprofit sector for its nearly 1,100ministry members, there is much more that could be done to tighten the standards it promotes and give donor’s greater confidence and representation in the ministries they support. Independent Advisers - Third, consultants and other advisors to both Christian ministries and donors are not as prevalent or skilled as those available to corporations in the financial markets. Therefore, both groups are less likely to obtain the quality advice they need when making important decisions. Ministry Research for Donors - Finally, the donor to Christian ministry has far fewer places than a typical investor to turn to get an unbiased assessment of the worthiness of individual Christian ministries. Wall Watchers’ free website www.MinstryWatch.com is the only entity that focuses entirely on analyzing Christian ministries and offers an independent view on the merits of just over 500 ministries. CharityNavigator.com also offers less in-depth independent assessments of both Christian and secular nonprofits on its website. Geneva Global is a for-profit researcher with substantial capabilities that seeks to analyze smaller, overseas-based ministry efforts for high net worth donors. The Generous Giving Marketplace provides a large database of ministry needs that donors can easily search to determine which they might feel called to support. A small number of other organizations offer very limited information for donors on both Christian and secular charities. There is little question, however, that Wall Watchers’ ministry research reports are currently by far the most comprehensive such reports anywhere on U.S. based parachurch ministries freely available to donors. A recent independent study performed by the Capital Research Center highlighted some of the strengths of Wall Watchers’ www.MinistryWatch.com service versus Charity Navigator (click here for Capital Research Center’s Report). The chart below highlights some of the shortcomings of the non-profit marketplace relative to the corporate marketplace that the organizations listed above are seeking to address. In order to achieve this, Christian ministries need to fully embrace the reality of the Christian Ministry Marketplace as well as the tools that will make it operate effectively, notably greater disclosure and measurement of results. For too long ministries have embraced a fear of full and honest disclosure thereby limiting the resources that could have been committed to the cause of Christ from donors who have sensed that they were not getting the truth, the whole truth and nothing but the truth. The level of disclosure in public charities pales in comparison to that of public corporations. Material information about problems in ministry projects or finances regularly goes unreported by ministry management. A similar lack of candor in the corporate world could result in criminal and regulatory penalties for corporate executives and the companies they lead. Donors would almost certainly respond with larger gifts to those ministries that could clearly demonstrate success and honestly admit to failures while offering logical plans to correct problem areas. As it is, donors are almost always foggy about what is actually going on in a ministry’s operations or how success can even be realistically measured and this lack of clarity undermines the level and growth in donations. While success in a ministry context can sometimes be difficult to measure, efforts need to be made to identify that which can be measured and compared in order for donors to be in a position to make wise giving decisions. In a functioning marketplace, the fog has been burned off by the sunshine of full disclosure and consequently, resources flow to those that most deserve them. When all parties to a transaction are aware of all relevant information concerning the transaction, those offering a product or service must continuously innovate to attract and retain their clients. This process promotes growth, innovation and progress. In the current Christian Ministry Marketplace, however, many ministries in essence stymie such progress and improvement by clamping down on and/or filtering the essential flow of information needed by donors to best administer their donations. Untold millions and perhaps billions have already been errantly donated due to incomplete or even inaccurate information. Ministry boards and CEOs need to honestly ask themselves if they need to repent in this matter of truthfulness. Many are not in a position to share such information because they have failed to gather it in the first place. In obscuring the whole truth to donors, they are clearly violating the Golden Rule. Because many donors sense that they are not getting the full picture and hesitate in their giving while others give in error due to incomplete information, they could even be accused of stealing from the Lord’s work in their efforts to protect their reputation and/or position from appropriate accountability! responsibility to administer their gifts properly. If they give based more on relationship rather than in response to the Lord’s leading, they could be accused of being a poor steward of the Lord’s resources. Donors need to ask themselves if they are giving simply to make themselves feel better. Such lazy donors have little regard for what actually happens to their donated funds as they have received all the satisfaction they desired by the simple act of making a gift without regard to how well it would be used. On the other hand, if the motivation for their gift is to truly bless someone in or through the Lord’s kingdom, they will naturally have a sincere interest in seeing that the money that they have been given stewardship over is being used to actually accomplish a worthy goal. Clearly, it may be impractical for every donor to expend time and resources overseeing the usage of their gifts. This is why entities that centralize this task for a variety of donors and can achieve economies of scale are needed. Giving is a sacrificial act of love. It recognizes that others needs are as important as our own and that we have a responsibility to our fellow man to uphold them in times of physical and spiritual need. Our gifts reflect a deep heartfelt pull to help others and this desire cannot be evaluated in terms of self-interest, as giving is a complete departure from our normal ego-centric decision making processes. Accordingly, the promptings of the Holy Spirit must be given priority in gifting decisions. Still, there is little question that improved donor stewardship of their giving would yield dramatically favorable results for the kingdom. Also, if donors do not demand more transparency and clarity from ministries, it is less likely to ever be delivered. Donors should ask themselves if they or someone representing their interests do more research on their investment portfolio than they or someone representing their interests (such as Calvin Edwards & Co. or Excellence in Giving that serve the high net worth donor) do on their giving portfolio. Given the eternal significance of the latter, it could easily be argued that far more effort should be devoted to giving to the Lord’s work than that which is devoted to the things of this world. Donors need to increasingly think like long term investors, even eternal investors, in the ministries they support and align their expectations and actions with this thought process if highly effective and strategic giving is to occur. Government Regulation - Perhaps a charitable version of the Securities and Exchange Commission (SEC) might be developed to promote a better framework for which non-profits, including the Christian Ministry Marketplace, to operate within. Preferably, this would be adopted via self-regulation but this is not likely to occur. We believe that not all ministries would willingly subject themselves to such self-regulation just as many currently are not ECFA members, thus government regulations may be required. 7. Serious fines and criminal penalties for failing to notify donors of material information affecting the operations of the organization. All these are already present in the financial marketplace and are one of the reasons why it works so effectively. None are present in the Christian Ministry Marketplace and thus higher levels of giving, modernization and development are undermined. While costs for larger organizations would rise somewhat to abide by these regulations, the return would be even greater as the financial markets for public corporations have proved. Self Regulation - The ECFA might tighten its membership requirements even more, seek means to constrain unusually high spending on fundraising and overhead, increase the number of audits performed, propose means to measure ministry effectiveness and begin to publicly censure those ministries that egregiously breach its standards to further insure that Christian ministries are above reproach and operating in a godly manner. Ministry Research - Groups like Wall Watchers should continuously seek to improve their research techniques, provide more valueadded subjective research on ministry effectiveness, produce more topical research reports to help educate donors to key issues in the Christian Ministry Marketplace and increase the number of ministries covered. Donor advocate organizations like Wall Watchers should proliferate, thereby giving donors a variety of high quality, independent sources of information to interpret the enhanced data released by ministries. · Ministry Mutual Funds - Ministry mutual funds might arise, advised by experts like Wall Watchers, National Christian Foundation and Geneva Global, which would help some donors, who are too busy to do their own in-depth ministry research, to optimize their giving. Larger donors might regularly hire personalized donor advisors like Calvin Edwards & Co. and Excellence in Giving in order to prepare highly specific, customized long-term giving plans and targeted ministry research that would maximize the impact of their donations. Large Christian foundations could seek ways to share with the entire Christian community the research they have done on ministries. Christian community foundations like the National Christian Foundation and Christian Community Foundation would prosper as Christians sought out their wise counsel and tax-efficient gifting strategies to increase the amount of money available to the kingdom. All this is currently possible and, if implemented, would assuredly lead to more and wiser giving by donors and smarter spending by ministries. The net result would be potentially enormous financial blessings for the Lord’s work. Accordingly, it is imperative that donors and ministries alike pursue the objective of a fully functioning Christian Ministry Marketplace with intentionality and vigor. Wall Watchers has already identified a number of “Word of Faith” ministries where financial accountability is nearly non-existent, the theology taught highly questionable, and which receive over $500 million in contributions from donors each year. In essence, this is $500 million of largely wasted money that could be instead targeted to the many financially transparent, biblically sound and effective ministries that already exist! There are also many ministries in our www.MinistryWatch.com database where spending on fundraising or overhead expenses seem out of control. Only a functioning Christian Ministry Marketplace, however, will cause donati ons to be targeted to the most worthy ministries and motivate ministries to manage their operations as wisely as possible. Below is a chart that contains a partial listing of those organizations that already exist to help make giving a more rewarding experience for Christian donors. Since the Christian Ministry Marketplace is not yet fully developed, Wall Watchers and the ECFA remain the dominant sources of information about Christian ministries outside of the ministries themselves. A natural tension between the two organizations exists because each is primarily advocating for opposite sides in the giving transaction. The ECFA’s main clients are the Christian ministries in its membership. Wall Watchers serves donors to Christian ministries. Both organizations share the common objective of increasing the amount of money available for the Lord’s work by raising donor confidence in the ministry’s carrying out these efforts. Both groups also seek to provide the donor with information that will assist in identifying ministries that are carrying the Lord’s work in an effective manner. The ECFA accomplishes this through its seal that signifies member acceptance of its standards and Wall Watchers through its comprehensive ministry research reports. Wall Watchers was formed in 1998 to assist the Christian donor in being the best giver possible. This is primarily achieved through ministry research reports on over 500 Christian ministries found on its www.MinistryWatch.com website. These reports are much like an investment bank’s research report on a corporate stock or Morningstar report on a mutual fund and aid the donor in understanding the key issues concerning a ministry’s operations. The reports include information on the ministry’s purpose, organizational details, its mission statement, history, program accomplishments, the ministry’s current needs, as well as financial efficiency ratings and transparency grades. Some also contain an expert subjective analyst report that includes information on the ministry’s strengths, weaknesses and theological positions. Additionally, financial ratios, historical income statements and balance sheets as well as recent news items relating to the ministry are displayed. Ministries are also given an opportunity to respond to www.MinistryWatch.com’s analysis of their operations in the Ministry Response section of the report. · MinistryWatch Reflections – Occasional in-depth articles on important matters facing donors. · MinistryWatch Direct – A newsletter designed to keep donors informed of timely issues and to highlight ministries in our database. · MinistryWatch Donor Alerts – Timely information about important breaking news on ministries and other topics of interest to donors. · MinistryWatch Tracker – A report that highlights trends in the www.MinistryWatch.com database. · MinistryWatch Focus – A more in depth research report on ministries than is typically available in our www.MinistryWatch.com database. · MinistryWatch Recommends – A report on a ministry that our research staff believes to be particularly attractive to donors. · MinistryWatch Quicktake – A brief ministry research report that can be easily shared. · MinistryWatch News Releases – Designed to share with the press the important findings of our research on Christian ministries. · MinistryWatch Response – Our analysts’ responses to the questions regularly submitted by our website’s users. · TheGoodSteward.com – A compendium of articles aimed at helping Christians to be the best stewards that they can be. A weekly email newsletter highlighting the latest articles is also distributed. Wall Watchers endorses the ministry of the ECFA and encourages others to do likewise. As the leading self-regulatory group in the philanthropic world, ECFA’s standards are worthy of emulation by nonprofits outside the Christian ministry community. Without the ECFA’s standard on disclosure of audited financial statements, Wall Watchers would likely have far less and/or far lower quality financial information to analyze on behalf of donors. Fundraising abuses would also be much more prevalent were it not for the ECFA’s standards in this area. Accordingly, donors to Christian ministries are blessed to have an organization like the ECFA working with ministries to make them more accountable. Still, donors need to be aware of the constraints that a self-regulator like the ECFA must work under and how this may limit the direct assistance the ECFA can provide for donors. First and foremost, donors need to understand that the ECFA’s primary responsibility is to the ministries that pay dues to the ECFA and thereby fund its operations. Before the ECFA was established there was no effective self-regulation in the Christian Ministry Marketplace. In response to the threat of government regulation following rising concerns about fraudulent fundraising practices, a group of godly ministry leaders had the foresight to see the need for a group that would establish standards which member ministries could adhere to and that would distinguish these ministries as upstanding citizens in the Christian Ministry Marketplace. Therefore, the ECFA was formed by a group of Christian ministries as a self-regulator or, as the ECFA prefers to be known, a peer accountability group, in 1979. While its formation was a foundational step in the history of the Christian Ministry Marketplace, it may be opportune to use the 25th anniversary of the organization to update its mission and operations to better conform with the current needs of donors. The ECFA’s primary purpose is to assist evangelical Christian ministries to earn the trust of donors, a goal that it achieves by ensuring that member ministries abide by its Seven Standards of Accountability. The ECFA seal, often found on ministry fundraising material, indicates that a ministry is committed to the standards and is currently a member. It does not necessarily indicate that a ministry is presently in compliance with ECFA standards as those ministries that have been discovered to be out of compliance are allowed to maintain usage of the seal while corrective processes are established. The ECFA does not inform donors when a ministry is out of compliance with its standards, as it believes that donor knowledge of the problems would not contribute to the redemptive process it engages in to restore a ministry to adherence to its standards. Many of the ECFA’s activities surround monitoring and servicing the needs of member ministries. Regional workshops are held for ministries to address important issues facing ECFA members and the organization acts as a resource for members in a variety of areas. Its website contains a listing of CPA firms that can be contacted by members to perform the financial statement audit that the ECFA requires each year. The ECFA’s website also contains a very brief organizational description and a number of headline financial figures of its member ministries. One of the member benefits is the ability to access more complete financial information on other ministries for comparison purposes. Non-members or donors, however, are not allowed access to this data. Wall Watchers is pleased to report that after initial widespread non-compliance with the ECFA standard that requires ministries to provide their audited financial statements in a timely fashion when requested, almost every ECFA member now provides this information in a reasonably timely fashion. Additionally, the ECFA never backed down on the requirement that ministries abide by this standard despite initially receiving a substantial number of complaints from ministries seeking to avoid sending Wall Watchers their audited financial statements. Presently, only one ECFA ministry gets a failing Transparency Grade (signifying refusal to deliver financial statements to Wall Watchers) from www.MinistryWatch.com – United World Mission, which has refused to send Wall Watchers its audited financial statements. Please see the chart below to see the percentage of ECFA and Non-ECFA ministries receiving Transparency Grades from www.MinistryWatch.com from “A” thru “F”. As can be seen by the large number of Non-ECFA ministries receiving failing Transparency Grades, these are far more likely to refuse to share financial information with Wall Watchers. Therefore, in terms of making ministry financial statements available, the ECFA is indeed a symbol donors can trust. Since hundreds of millions of dollars are donated each year to ministries receiving a failing Transparency Grade, donors and all participants in the Christian Ministry Marketplace need to send a strong message to these ministries that such behavior will no longer be tolerated. Allowing donors to know how ministry funds were spent is the most basic requirement of stewardship and accountability. It is virtually impossible to formulate a logical reason for not doing so. There is a high probability that hundreds of millions of dollars from uninformed, trusting donors are being misused by the ministries who are unwilling to perform this most basic task of accountability. Untold additional good works could be done if these millions were simply re-directed to the many excellent ministries available or if greater oversight resulted in significant reforms at these currently non-transparent ministries. Perhaps most telling to donors about the fact that ministries are the ECFA’s primary clients are the things that the ECFA does not do. While its website has a number of helpful guides for donors, ECFA does not hold workshops for donors. They do not provide press releases or otherwise seek to highlight to donors the ministries that have violated their standards, refused to take corrective action and therefore been removed from membership in the ECFA (ministries that have left or been removed from membership in the ECFA are noted on the ECFA’s website with a brief notation as to the reason). Nor does the ECFA reveal which ministries have been found to violate its standards in the past, have been caught doing so and have repented, yet remain members of the ECFA. There is no way for donors to know if the ministry they support has ever been found in violation of ECFA standards or perhaps been found in violation multiple times. There are no doubt ministries that at this moment are being investigated by the ECFA for standards violations but which donors are unaware that anything may be amiss. Additionally, the ECFA’s seal is limited in the information that it supplies to donors. A ministry either passes and is a member, or it fails and does not gain membership. It is a black or white choice with no shades of grey to help donors discern which of those member ministries are the best or worst in their class. Given its role as a peer accountability, membership organization, it is impossible for the ECFA to make any judgments that would help donors distinguish the relative merits of one member over another. This would simply not be acceptable to its members. Thus, the approach that the ECFA must take is to set the bar at a certain height and approve every ministry that can get over it regardless of whether the bar is set at an appropriate height, was easily cleared or was nearly knocked off. As a self-regulator, it simply cannot be in a position of judging its dues paying members against one another. It is also difficult for the ECFA to get members to agree to raise the bar. Additionally, it is unlikely that the ECFA could require a ministry to address an issue that would be of concern to donors that is not covered by the ECFA’s standards. The ECFA’s limited resourc es also mean that only a small portion of member ministries are subject to a field review each year (roughly 10%). Reportedly, a significant number of ECFA members have never been reviewed. Given the importance that the possibility of a field review has on ministry behavior, this situation is far from ideal and can cause donors to wonder whether the ECFA is able to adequately carry out its mission with its present level of funding. Another manner in which the ECFA is limited in what it can do is comment on non-member ministries that may be violating its standards. Thus ministries outside of ECFA membership are not at all subject to its standards or specific ECFA comments about their activities. Since the ECFA’s current standards are very good , donors should be particularly careful when donating to non-ECFA Members who may or may not be abiding by them. Also, a ministry may not be a member of the ECFA due to theological issues and donors should thoroughly investigate this aspect of non-ECFA ministries before donating. As a donor advocate, Wall Watchers, through its www.MinistryWatch.com website, has no such restriction and can comment on any ministry it chooses to review and more than 150 non-ECFA ministries are currently included in our database. Also, our ministry research reports indicate which ministries are ECFA members and which are not so that donors can know when they need to be extra vigilant. When one of its member ministries gets in trouble, the ECFA is also hesitant to speak about these problems publicly. In fact, it will typically only comment if the information somehow gets into the public realm by another manner or in response to direct inquiries about a ministry. As a result, it is likely rare that the ECFA investigations of member ministries’ activities are disclosed. ECFA policy states that, if asked, they will confirm if a review is in process, what standards are in question and what decision has been reached once a review has been completed. Recently, for example, there was no ECFA press release notifying donors of the shameful behavior of the Christian Research Institute’s (CRI) CEO in misappropriating ministry funds for personal use, because it is the ECFA’s goal to protect the reputation of its member ministries as long as a ministry is willing to work with the ECFA to correct its failings. (MinistryWatch has prepared two article relating to the Christian Research Institute’s problems: CRI and Whistleblower that we would highly recommend that donors read). Even when a ministry refuses to cooperate and is removed from the ECFA, the ECFA makes no attempt to alert donors of the removal or the reasons for the removal through a press release. Donors discovered the presence of CRI’s problems only because a ministry insider, who was later fired, went to the press as well as the ECFA with their concerns and the ECFA had to respond to press inquiries. Even then, the ECFA has recently been subjected to criticism from the ministry community for even its rather minimal comments on its ministry investigations. This attitude of seeking to hide material incriminating information from donors could be illegal in the realm of the public corporation and certainly should not be accepted in the world of public charities either. Behavior of this sort in a public corporation would likely lead to the resignation of the CEO and perhaps criminal charges. This represents a powerful incentive for corporate executives to stay on the straight and narrow path. and should be discouraged rather than encouraged by representatives of the ministry community. The notion that covering up ministry wrongdoings is in the best interests of the kingdom is flawed. Donors are the aggrieved party when ministry leaders abuse their trust and they should be informed of the problems if the redemptive process is to be truly complete. Resignations of guilty ministry executives and board members who failed in their oversight function should also be considered part of the redemptive process, even when they have acknowledged their mistakes and publicly repented. Such resignations rarely occur currently despite serious problems being uncovered. The present system utilized by the ECFA of working behind closed doors to repair the damage caused by wayward ministry leadership is fundamentally unfair to the donor and needs to be revised. Concealment of misdeeds only works to increase donor suspicions about a lack of integrity in the Christian Ministry Marketplace when word ventually leaks out about a problem, as it inevitably does in at least some cases. For instance, the damage caused to the Gospel by the skullduggery of Jim and Tammy Bakker of PTL fame, is immeasurable. Arguably, had the Christian Ministry Marketplace been more fully developed when PTL was involved in its financial shenanigans, many donors could have been spared the fraud they suffered, and the body of Christ would not have suffered the black eye it did because of the criminal activities of Jim Bakker. The ECFA also does not require an absolute limit on the amount of money that might be spent on fundraising costs or administrative expenses. Ministries can incur exorbitant costs in either or both of these areas and still be in compliance with the ECFA’s standards. This does not provide donors with a full and accurate picture, contrary to biblical admonitions. Many, but certainly not all, of the 352 ECFA ministries in the www.MinistryWatch.com database have costs in these areas that seem fair and well within the boundary of 35% of total revenues set by the secular self-regulator, the Better Business Bureau Wise Giving Alliance. Other secular donor advocates suggest that 25% is a better figure to use for total fundraising and overhead costs. Donors can easily find these ratios at Wall Watchers’ www.MinistryWatch.com website and are able to compare various ministries on these financial measures using “The man of integrity walks securely, but he who takes crooked paths will be found out” our Interactive Table screening tool. Still, because of a lack of a limit on such spending for ECFA members, many ministries exceed the 25% and 35% limits suggested by other groups. The chart below highlights where ECFA ministries in the Wall Watchers database fall on this measure. Fully 31 (8.7%) of these 352 ECFA members exceed the 35% limit and 109 (30.9%) exceed the 25% limit. As a result, at least in this regard, donors might reasonably ask if the ECFA insignia is truly a seal that can always be trusted. Four ECFA members actually had a ratio that exceeded 50% and the two worst were above 71%! While good reasons may be found for temporarily high spending levels, which should be accommodated by any standards, this is an area where the ECFA would be wise to tighten its standards. The ECFA does have advantages over Wall Watchers in several areas. First, its ability to perform an on-site visit of the operations of its members allows it to uncover more issues of concern to donors. The ECFA averaged about 100 such on site ministry reviews in recent years (a little less than 10% of its member base). This allows the ECFA to get a close, inside look at the procedures utilized by a ministry while Wall Watchers is relegated to primarily examining documents released to the public such as audited financial statements, fund raising literature and annual reports. While these documents are extremely helpful, there is still plenty of opportunity to obscure troubling financial and operational issues, which masks the truth from donors. Moreover, the audited financial statements often do not address emerging problems that might not be immediately captured in the financial results of the organization. Unfortunately, the ECFA does not share with donors the results of its on-site visits. Wall Watchers is reasonably confident that the ECFA deals with any infractions to its standards in a manner that would satisfy most donors but even greater confidence could be instilled in donors if such actions were made public. Second, the ECFA has a much larger and more stable funding base than does Wall Watchers. The ECFA’s nearly 1,100 member ministries provided it with over $1.0 million in revenues in 2001 and total revenues reached $1.1 million. Since its inception in 998, two families have largely funded Wall Watchers’ operations. Presently, the budget to support the work of the ministry is less than $400,000 annually and the ministry relies on significant volunteer staff as well. Up to this point, few large or small donors have felt compelled to support the causes of advocacy and education for the Christian donor. This despite the fact that Wall Watchers’ websites are heavily utilized with over 30,000 user sessions each month, making them, to the best of our knowledge, the most visited web destination in the realm of Christian philanthropy. in the current Christian Ministry Marketplace. As a result, Wall Watchers has not been included in Christian Ministry Marketplace industry events. We are hopeful that, by God’s grace, the current leaders in the Christian Ministry Marketplace will afford donors and those that represent them, a greater role in the development of the future Christian Ministry Marketplace. dues, while Wall Watchers has relied on only two families for the vast majority of its funding. There is clearly something very wrong with the unwillingness of Christian foundations and large donors to invest in the integrity of the Christian Ministry Marketplace. Some larger foundations that make sizable gifts have their own research staffs, which are able to gain access to and closely examine ministries that they either support or are considering supporting. Unfortunately, this information is generally not available to almost all other donors. These wealthy foundations should seek ways in which they can share their work with donors who are unable to afford such due diligence in order to promote a more informed Christian Ministry Marketplace. Sadly, the low level of financial support for both the ECFA and Wall Watchers as well as other organizations that should also exist but cannot due to lack of vision and funding, likely costs well-managed Christian ministries millions of dollars annually that would otherwise have been confidently donated, or donated more appropriately, had a more effective oversight function been available. This is a very serious issue for all participants in the Christian Ministry Marketplace and demands immediate corrective action and comprehensive long-term strategic planning. Furthermore, this lack of adequate funding coupled with any further ministry abuses and mismanagement may eventually raise the question for the need for additional governmental oversight, something that ministries and donors alike may wish to avoid by taking appropriate, donor friendly actions ahead of regulatory pressure. It would be natural for the government to turn its attention to the non-profit sector following the many reforms undertaken in the corporate sector. Smaller donors, in particular, need to recognize that their views are regularly not represented and that supporting organizations like Wall Watchers and other donor-focused groups could help insure that their interests receive a fair hearing in the Christian Ministry Marketplace. Wise and discerning ministries will also pursue donor empowerment to bring some balance to the small donor/ministry relationship. While such changes will at first seem risky to those who benefit from the status quo, careful consideration of the merits of these suggestions will likely calm any unwarranted fears. As matters currently stand, donors to public charities must sit in the back of the bus compared to the protections afforded investors in public corporations. This is not only wrong but also foolish as it deprives ministries significant financial and relational benefits that a more balanced and vibrant relationship with donors would bring. Long suffering donors could not be faulted if they took a “No Donations without Representation” stand at some point in the future if progress is not forthcoming. In essence, Wall Watchers believes this is already quietly happening, as we are certain giving would be significantly greater in a more open, transparent and functional Christian Ministry Marketplace. Much work needs to be done to improve the lot of donors and to raise the standards in the Christian Ministry Marketplace so that the Lord’s work will not be short-changed. While the ECFA provides the best self-regulation in the nonprofit world, its standards are still far from what corporate self-regulators require and should be reviewed and updated. Wall Watchers may currently provide the best research on Christian charities but its budget and resources are stretched thereby limiting it’s ability to extend and improve its analysis of Christian ministries. Government oversight of charities is generally very weak and affords little protection for donors. Similar to what is happening in the corporate financial markets, state regulators operating under limited budgets, are often taking the initiative from the federal regulators due to inaction by federal authorities. While Wall Watchers and the ECFA are leading the way for philanthropy in general and the Christian Ministry Marketplace specifically, ministries and donors alike must awaken to the fact that the dysfunctional nature of the current situation is constraining donations and limiting progress and innovation. The dominant forces in the Christian Ministry Marketplace would be well advised to wholeheartedly support an acceleration of efforts in the area of accountability, independent ministry research and donor empowerment. It would be for their own good, the greater good and the good of the Kingdom. Wall Watchers encourages comments on the ideas expressed in this MinistryWatch Reflections article. A comprehensive dialogue surrounding these important issues can only advance the Lord’s work and we hope that this paper will help stimulate a much-needed discussion. While some of the points made in this article may at first trouble some established participants of the Christian Ministry Marketplace, we trust that reasonable consideration of our thoughts will ultimately cause them to be seen as a blessing to the cause of Christ and those ministries earnestly seeking to do His will, as they are indeed intended to be. We believe that the ECFA, Wall Watchers and other related organizations not yet even formed are tools in the Lord’s plan to impart even greater blessings through Christian ministries.